Brandon and I just finished a stellar month in Indonesia and were deciding which country we wanted to visit next. The more and more we searched we soon realized that Ubud was calling us back for more. We had been traveling pretty “fast” the previous 6 months and were craving some routine. No doubt our minds, bodies, and work-life would benefit from a little structure (and no more 14 hour buses for a while). We fell in love with Ubud, Bali the first time we went there a few weeks prior. So we decided to rent an apartment and stay a while. We found the perfect apartment, got memberships at Yoga Barn and were motivated to get some serious work done. Two days later, I’m crossing the street and get smacked by a motorbike I never even saw coming. When I finally realized what happened, I was laying on my back in the middle of the chaotic street. There were tons of locals hovering over me, my legs were bleeding, and I had intense pain coming from my heel. After assessing my injuries (not life threatening) a local helped me up and gave me a ride back to our apartment. I sat in our apartment crying and wondering what I was going to do… Eventually Brandon came back from the gym and found me amidst my temporary misery. He helped calm me down and we discussed our options. Luckily the scrapes and bruises weren’t serious but my heel had me worried. I couldn’t bear any weight on it without excruciating pain. What do I do in a foreign country with a potentially serious injury? Over the course of the next month I visited countless hospitals, doctors, specialists. They told me I damaged soft tissue in my heel and it could take months to heal properly. A frustrating prognosis since we planned on traveling for another 5 months before stopping home for Christmas. In the months to follow, I tried everything the doctors recommended: cortisone shots, more x-rays, MRIs, icing, stretching, crutches, etc. I ended up visiting doctors in 3 countries and spending over $1,500 USD in medical bills. Luckily we had Travel Insurance with World Nomads. I sent World Nomads my receipts and thankfully they reimbursed every dollar I spent. Getting injured while traveling can change the entire direction of your trip. Unfortunately, it’s difficult to plan ahead for accidental injury. However, there are steps you can take before your trip to ensure you are covered in case of emergency. 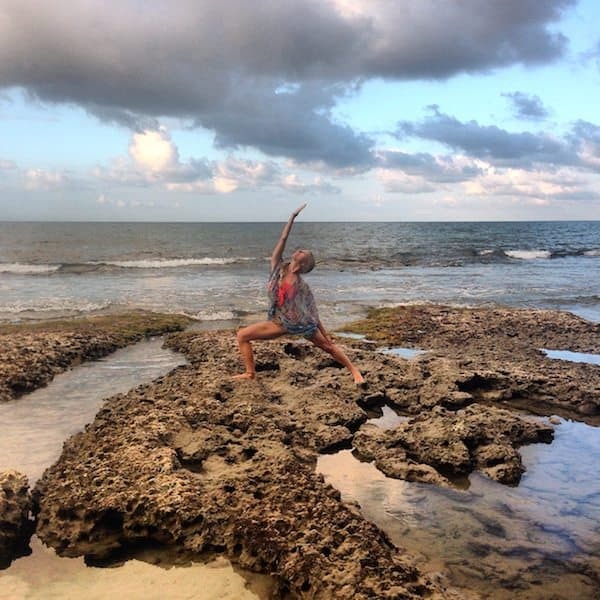 As someone who has been injured while traveling, I have a few things to share about what I learned during the process. If you’re like me, you’ll hear your mom’s voice in the back of your head until you finally bite the bullet and just do it. But I’m healthy! I’m fit! I’ve never broken a bone! It doesn’t matter… even the healthiest and fittest of all can still get into an accident. While traveling, it’s a no-brainer. You just NEVER know. Having insurance will give you (and your family) peace of mind while on the road. Then you don’t have to question whether or not you should indeed bungee jump in Queenstown. (For the record, you should never question that opportunity!). 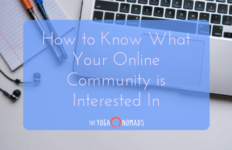 We use World Nomads and would highly recommend this company. It’s easy to use, affordable and covered all of our unexpected expenses related to our injuries on the road. 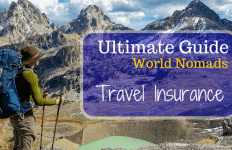 Get a quote from World Nomads or start with our guide on travel insurance. I know, I just finished telling you being fit and active doesn’t matter… While getting into an accident can happen at anytime to anyone, having body awareness and being healthy does give you a small advantage. 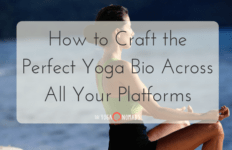 Practicing yoga has helped us immensely with overall body awareness. We both have a thorough understanding of the thresholds of our individual bodies, in addition to having strong core centers. Our reactions to unexpected movements are quick and responsive, which helps prevent us from accidents. We also practice being healthy on the road by how we fuel our bodies with food. Eating a diet low in sugar, alcohol and processed foods helps our bodies function at their optimal performance. 3) It can happen to anyone. In the end, accidents happen to anyone. While there is nothing wrong with channeling your inner 8-year old self and believing you’re invincible, it CAN still happen. 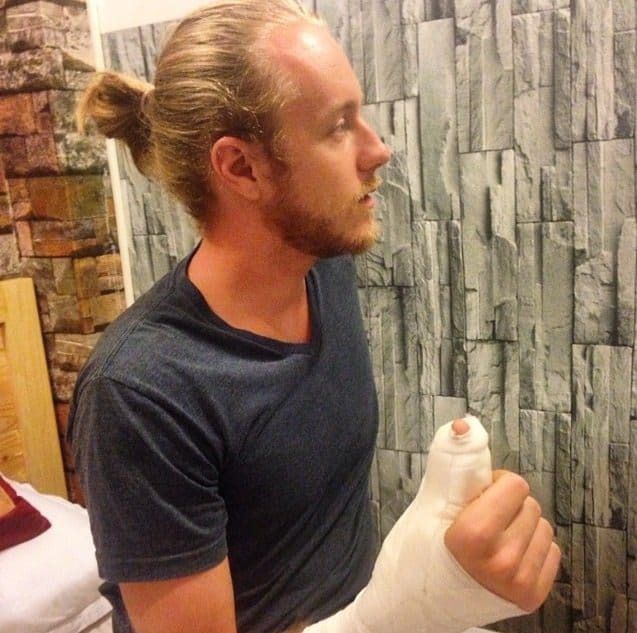 Brandon tore a tendon in Vietnam and had to have surgery to repair it. Thankfully our travel insurance covered all $2,500 USD of the hospital bills. In order to be fully present and enjoy the potentially more risky activities (ex: trekking the Annapurna Circuit or summiting Mt Rinjani) you should have travel insurance. Being covered will help lower you and your mom’s anxiety while traveling. You want to be able to enjoy every day completely and fully. Just keep in mind, no matter how bad you want to believe it, no one is completely invincible. 5) But don’t let it ruin your fun. 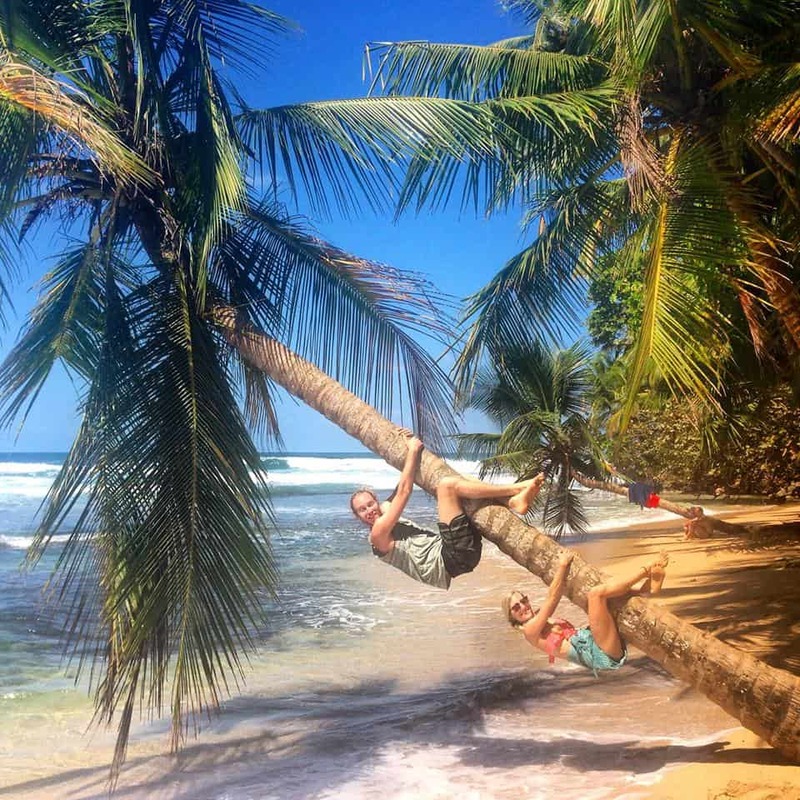 The Yoga Nomads having fun in Costa Rica! 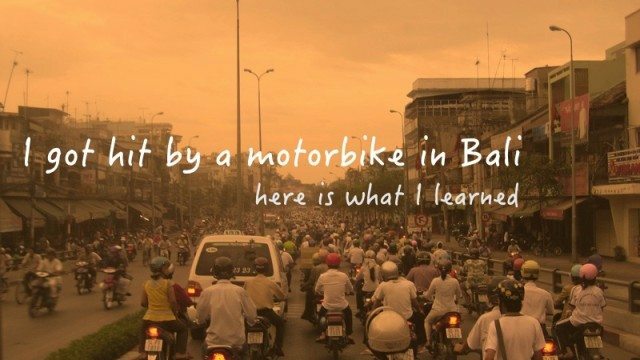 An unexpected accident (like getting hit by a motorbike) can most certainly dampen your mood for a few days while traveling… but it doesn’t have to ruin your entire trip. It’ll challenge you to change your perspective, but most often it’ll be a blessing in disguise and you’ll come out on the other side learning something beneficial to your overall well-being. Sure, you may have to adjust some of your plans or change activities accordingly, but keeping a positive attitude throughout your recovery will not only help you manage, but those around you, too! I just bought World Nomads travel insurance for my upcoming mission trip to Africa. I chose this plan after comparison shopping. World Nomads Travel insurance is far and above the best plan out there. My correct choice was just confirmed reading this article! Although like you, I don’t plan to use it! But I have a greater peace of mind knowing I will be covered if something happens. We always recommend our guests to look into Travel Insurance.